Walmart has quite a hill to climb. Though Walmart.com launched in 2000 to Amazon.com's 1994, Walmart's online sales amounted to $14 billion in 2015, to Amazon's $107 billion, notes the Journal. 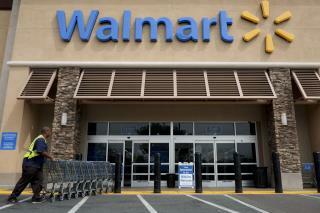 Including brick-and-mortar sales, though, brings Walmart's revenue to $482 billion. In a year, Jet.com reached a run-rate of $1 billion in revenue. But at Business Insider, Hayley Peterson delves into three reasons—customer base, distribution center potential, and Jet.com's shipping prowess—why the acquisition could become a "nightmare" for Amazon, proclaiming "everyone is underestimating Walmart's ability to crush Amazon." At Reuters, Jennifer Saba writes of some of the things that are holding Walmart back, among them, Amazon's move into Walmart's turf with expanded fresh-food delivery. TechCrunch has some interesting details on Jet.com founder Marc Lore, whose prior business, Quidsi, was scooped up by, yes, Amazon for $545 million. Lore could walk away with $750 million from the Jet.com deal; he'll remain at the helm. Your bit of bar trivia: Jet.com takes the e-commerce startup sale record from Zulily, which was acquired by QVC for $2.4 billion, reports recode. Kate you're not Elizabeth without glasses and make-up on are you? Where is she? You didn't kill her did you? Dissect her? Got any leftovers? I'll check E-bay right now. Jet.com earns it market share by only making money off the membership fees, providing the lowest prices on the actual goods possible. Not sure if that's going to stick around after the Walmart takeover.